Welcome to use our tuner for free online. 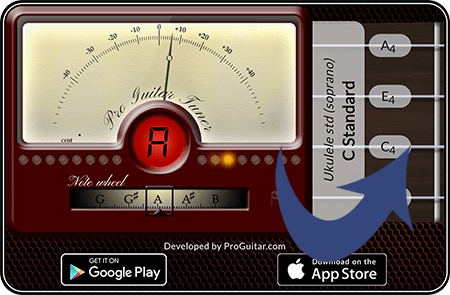 The app is fully chromatic and therefore the guitar tuner online does also support a variaty of stringed musical instruments. Click on any of the links below to read more about how to use the app for each specific instument. Also, it does work both for electric guitar and acoustic guitar. 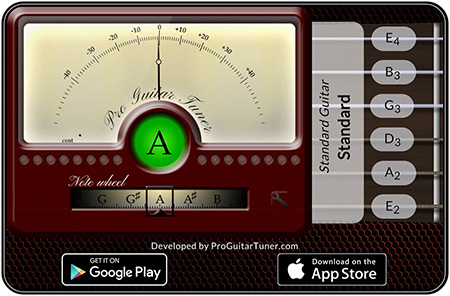 If you are using a smartphone or tablet the guitar tuner app is best to use because the online tuner does not have smartphone support. If you are using an acoustic guitar or any acoustic instrument the tuner will by default use the built-in microphone. However, if you want to tune an electric guitar or any plugged in instrument you have to adjust the input source. Click on the button "Show Instructions", right below the tuner to read more how to change this setting. Follow the steps in how to Setup Instrument and Tuning and select your preferred mandolin type. To tune your ukulele you find all the tunings by clicking on the white area with the text "Standard Tuning". Read the article covering, in more detail, how to setup the app when tuning the Ukulele or for a more general instruction, read section 9. 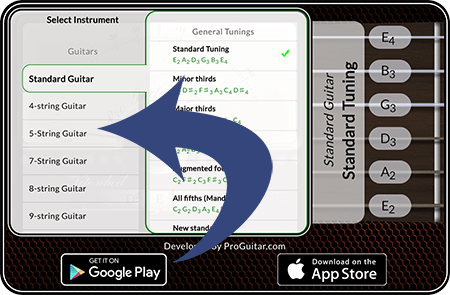 Within the tuning application you will find a lot more variants for other non-standard guitar tunings than listed here. For a complete list of alternate violin tunings, open the tuning settings in the app. Read the last section to understand how to tune a violin using the tuner. The online guitar tuner includes "all" Balalaika sizes but the most common size is the Balalaika Prima. For access to the complete list, see section 9. There are many different banjo types and tunings. Therefore there are not one single standard. Below comes a list of all the banjo tunings in the app. 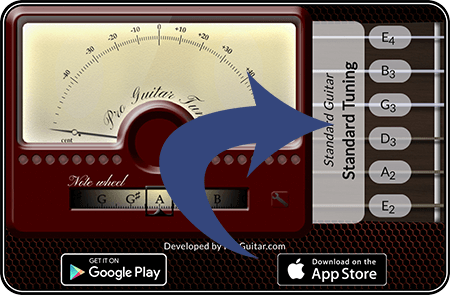 Click on the area shown by the blue arrow and a window will open on top of the guitar tuner, see the image below. Choose your preferred instrument, to move up and down in the list you click and drag. After selecting an instrument, all the available tunings for that specific instrument will appear to the right. Choose the desired tuning by clicking on the area of a specific tuning. You should now hear a sequence played for each string and the fretboard will be updated with your desired tuning. At any time you can click the strings on the fretboard to listen to a reference tone. One common way of tuning the guitar by ear is to tune the guitar to itself. If you are a beginner it can be a good practise to use a combination of a reference tone and a guitar tuner. One thing to notice is that the online guitar tuner does not show the actual octave. For that you need to download the smartphone app, which at the moment is of much higher quality than the online app. To get the app to listen to your playing you will need to have flash installed and allow microphone access. See further instructions directly below the tuner by clicking the button "Show Instructions". If you have any suggesions or think any other alternative tunings should be added, please send us a note through the guitar forum.